Mycket rymlig 6 sovrum, 5 badrum villa sova 12 + i luftkonditionerade rum. --- UTANFÖR är 3 hårda däck, två täckta och en inbäddad under ett mangoträd. Det finns en stor pool ligger i härliga tropiska trädgårdar. --- INSIDE är ljus och luftig, en mycket stor matsal / vardagsrum, teak bord och bekväm soffa och stolar. Det har framlagts i hela i en blandning av lövträ, sjögräs och moderna tyger. Det finns ett stort kök, ytterligare matbord, stor hall och TV-rum. --- ENTERTAINMENT: Detta är vår semester hemma så det är perfekt för familjer med barn. Det finns en stor HDTV och DVD-spelare, en leksak låda med ett bra urval av barns lekar och leksaker, massor av böcker och DVD samt en gunga och repstege i trädgården och cyklar för barn upp till C9. --- Baby & TODDLER utrustning läskigheter inklusive barnvagnar, bilsäten, barnsäng, babysäng, barnstol, baby bad, potta och plast plattor / bestick. Du behöver inte ta allt på planet. 100% Recommend Renting This Villa! 4 families and a total of 15 of us ranging from age 12 to age 53 rented this villa for 14 nights and we were immediately wowed by the presentation of the house, then as we moved into the garden, we were amazed by the beautifully kept lawn and surrounding exotic trees which were complimented with an array of lovely sounding birds. The pool was of a nice size too and cleaned every few days. The 3 parts to the house with separate kitchens were adequately furnished with utensils and everything worked perfectly. The house workers Andrew, Oneta and Kielan were polite and very helpful at all times, providing us with clean towels, and bedding when needed and keeping the house generally clean and tidy. These guys could not be more helpful. Andrew provided our welcome meal too which was fantastic and reasonably priced. The house is perfectly located to Mullins beach which is literally 5 mins from the bottom of the garden gate and it really is a stunning beach. Go and watch the sun set, it is amazing. The house is situated between Holetown and Speightstown which are 2 contrasting towns. The first being upmarket and expensive, the second very dated and reasonably priced. Buses run frequently until around 7pm, so getting to both is easy, but I recommend hiring a car although we didn’t as we wanted to feel the whole Bajan experience. Our boys loved the boogie buses too! Finally, our taxi man recommended by our host Big Sean was superb on arrival, then on our departure. He made several pickups for us to take us to the airport on separate days and he was always on time, friendly and helpful. Our hosts Sarah and Simon have been the most helpful I’ve ever experienced having booked many private homes in different countries. Always available via messenger, very informative, honest and welcoming in the use of their beautiful home. We are already saving our pennies for a trip in 2020, so hopefully this house will still be there for us! Thank you so much for a helping us have the perfect holiday!!! 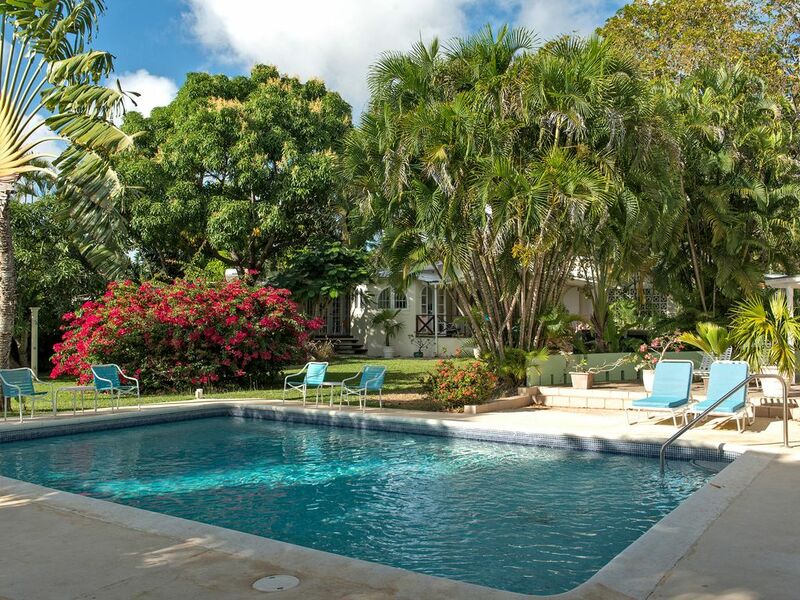 The beauty of Mullins Bay House is that it is wonderfully situated just a short walk from the Beach (5 mins at an amble pace), but also has the benefit of being positioned in a quiet road with a sizeable garden and a pool giving you the choice on any given day of pool, beach or both. The house itself is comfortably furnished and well equipped with everything that you would need for a family holiday. The bedroom I stayed in was light and airy with the benefit of a ceiling fan as well as air conditioning which allows for a very comfortable night without the chill of aircon. I had an ensuite that was fully functioning and I particularly loved the glass bricks that give it a lovely light in the evening sun. The house has a lot of indoor space that children might use more during the hottest parts of the day, but we found ourselves out on the deck most meal times enjoying the lovely views of Bourganvillia and Palms in the garden, and also monkeys which are most entertaining! The staff are lovely and unobtrusive, great to have beds made and washing up done on the days they are in, also have a night of not cooking and have a meal bought in by Andrew, traditional Bajan food, delicious and you don't need to be in to receive it, we came back from Sundowners to find it waiting for us, fabulous. Like the beach the bus stop is just a short walk and we used the yellow "Reggae" buses all of the time, you can travel in any direction from one end of the Island to the other for 2 dollars, and they are great fun and run very regularly, no timetable just go to a stop and wait, never for very long (all the bus stops are named after ladies) worth remembering which yours is! Although Barbados is awash with high end restaurants we did not use these but spent most of our time at beach type bars that offer fantastic Rum Punches/Sours both are delicious, and simple meals of fresh fish which were very very good. Ju Ju's which is next to Lonestar became a favourite as it is "on" the beach, and The Little Bristol Bar in Speightstown offers live music on some nights, both perfect for Sundowners. Smokeys' fish is the best, and close by, and can be bought home and cooked on the BBQ and the supermarket in Hole Town has everything you need. All in all, a wonderful stay and I would thoroughly recommend Mullins Bay House. If you had two families holidaying together the configuration of the house works brilliantly as there are two kitchens so you have your own space and privacy. Great Villa if you are a large party. We spent our second New Year at Mullins Bay House and I must say this trip was even better than the last. The owners had completed at lot of improvements to the decor and rooms. This Holiday home is in a perfect position, close to Mullens Beach and some of the best restaurants on the island. Andrew the house keeper and his staff were all first class and nothing too much trouble, Andrew even organised cooking a Bejan meal for ten one evening. Looking forward to going back for the third time. We had a fabulous time at Mullins Bay House with 3 generations of our family celebrating a special birthday and a big anniversary. We wanted somewhere special and were delighted with the beautiful gardens, big pool and comfortable bedrooms and lovely beaches very close by. The staff were very helpful especially Andrew who heads up the team. The restaurant suggestions from Sarah were very helpful and we had excellent meals at the Fishpot, JuJu's, Cariba and Tides. The south coast has some super beaches and we loved the Deli near Crane Beach. The young children were enchanted by the Green Monkeys scampering across the lawn. A magical time for all. The perfect venue for our family celebration. Location exactly where we wanted between Gibbs and Mullins beaches. Staff excellent, could not have been more helpful and friendly. The garden area beautifully kept and spacious enabled us all to relax and make the most of this special occasion. We would definitely visit again. Rental rates are for up to 12 people sleeping at Mullins Bay House and include maid service. Additional adults are £126 per week, children £70pw. All linen and bathroom and beach towels included. Late availability offers may be available if you are booking at short notice - please contact us.